This is one of a series of Player Q&A's for the Cedar Rapids River Kings. This Q&A was submitted to all 10 IFL teams. We will post those which we have received periodically throughout the season. Thank you to River Kings New Media Coordinator Paige Parker and General Manager Ryan Eucker for assisting in bringing this feature to our readers. Photo courtesy Cedar Rapids River Kings. Graphic by David /SCtoC. Data input by Monika /SCtoC. 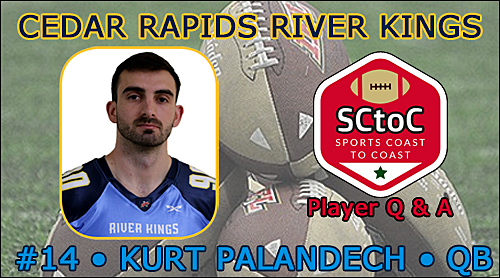 Kurt Palandech is a 6'2", 200-lb. rookie quarterback out of the University of Nevada-Las Vegas (UNLV). He appeared in 24 games over three collegiate seasons, starting in three games his junior year and another three his senior year. He passed for 1,489 passing yards with 14 touchdowns, and rushed for 728 yards and nine touchdowns. He hails originally from Plainfield, Illinois. Being honored as a William Campbell Trophy semifinalist. My father has inspired my athletic career. Play at the highest level possible. They support me in every way. Love the journey ... chasing to reach my athletic peak. My favorite movie is The Departed.